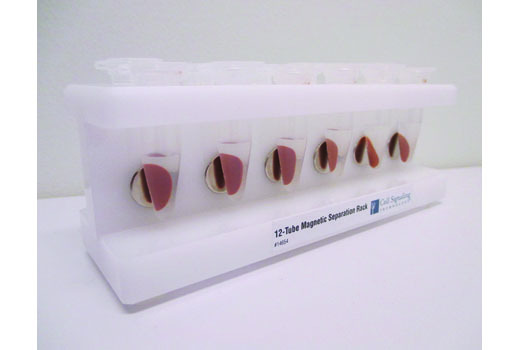 Place tubes containing magnetic beads in the Magnetic Separation Rack, wait 1 to 2 minutes for the solution to clear, and then carefully remove supernatant. Remove the tubes from the Magnetic Separation Rack, add new solution, and resuspend the beads by gently vortexing or rocking the tube. CAUTION: This device contains rare earth magnets that can be extremely powerful. Care should be taken when handling. Keep magnetized parts away from mechanical/electrical instruments that may be damaged by high magnetic fields.